There’s just about nothing better for upper body strength training then a dip station such as the Ultimate Body Press Dip Stand. 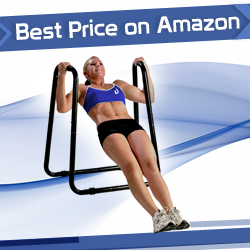 This dip stand makes the perfect accompaniment to your home gym and allows you to do a number of exercises including knee raises, inverted rows, tricep dips and more. The Ultimate Body Press Dip Stand is easy to assemble with its color-coded parts. No tools are necessary. The dip stand is made from thick steel and is strong enough to last a lifetime of use. The dip stand can hold a maximum weight of 350lbs and suits people up to 6’5” tall.